Gibney, who received an Academy Award nomination for Enron: The Smartest Guys in the Room, explores Dilawar’s case in the context of experiments conducted by 20th century social psychologists like Stanley Milgram, while also tracing how similar interrogation methods (and personnel) would soon migrate to Abu Ghraib. Gibney confronts several of Dilawar’s interrogators and guards at Bagram, as well as former detainees and members of Dilawar’s family, in on-screen interviews. The results are devastating, impassioned, vital. A driving force for the filmmaker is the memory of his father Frank Gibney, a Naval interrogator in World War II. Before he passed away, Gibney asked his father why torture was verboten during his interrogations. “Well, because we didn’t need to and because we thought our principles gave us strength that our enemy didn’t have,” he replied. My conversation with Gibney, conducted in New York in January, opened on a similar note. 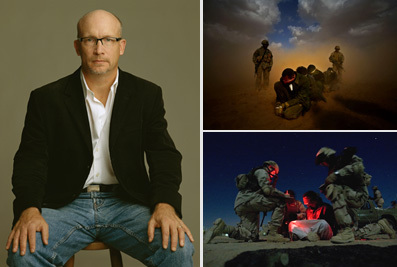 Alex Gibney: My dad’s experience was exactly like that. In fact, I was reading some of his memoirs recently. I have his interrogation logs. He interrogated a fairly senior guy in Okinawa, Colonel Yahara. He developed a pretty good rapport with him and got a lot of good information. But at some point, Yahara turned to my father when he was interrogating him and said, “Gibney-san, you really should be a little more careful.” And he described the trip they had just taken together in a Jeep. He said, “Your sidearm was right there, I could have taken it from you, knocked you flat and run off, gone back to my lines. You really have to be more careful.” [Laughs] My father thought, “What kind of a soldier am I?” But it also testified to the fact that they had already developed a kind of rapport that got a lot more out of him than waterboarding. SS: Why are claims of torture so rampant in this current war? AG: It’s not exceptional. That’s why the war in the Pacific is such a good comparison. We described the Japanese as fanatical, beyond reason. “These people are just different. These are the kinds of people who would fly suicide missions with planes.” Does that sound familiar? What is it that’s so different? I think what’s so different is you have a civilian leadership that was weak, arrogant and fundamentally ignorant. And I think in a peculiar way, this is the dark lesson I learned from Taxi to the Dark Side: I think they understood, either intuitively or consciously, that there was a political advantage to torture, which is that you always get back the answer you want to hear. And when you’re trying to go to war in Iraq, for example, that can be very powerful and very seductive, about gathering intelligence in a way that always seems to come out right, as far as you’re concerned.